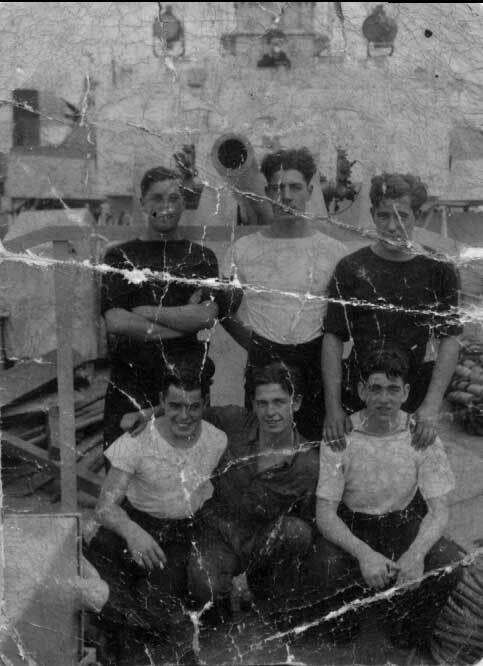 I read with interest that Ross Fisher has pictures of HMS Mourne and would like to contact others who have interest in HMS Mourne. I am researching this for my Mother, 3 Aunties and an Uncle who lost their brother on this ship in 1944; Peter Costello, aged 19. I have found your site extremely informative and interesting. Here is the Commonwalth War Graves Commission entry for Peter Costello, as you can see its recorded at the Plymouth Naval Memorial. I will see if I can acess their site and get a copy of that entry for you, so more anon. In the meantime I will pass your message on to Ross. Many thanks for this. I attach a photo my Mum found of Peter on the Mourne. The date corresponds on the back which has been stamped ‘From HMS ship passed by censor’, some people may find this interesting. Peter is in the back row in the middle and I am afraid we do not have names for the others.